I noticed Anna’s Hummingbirds flitting about the Jasmine flowers in the California backyard, but they didn’t really look like they were foraging on them. 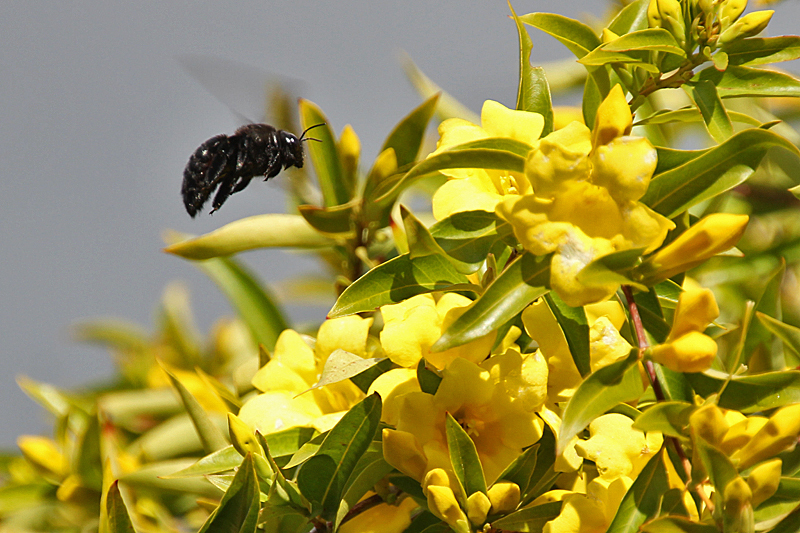 However, gigantic black bees were definitely probing the flowers in a consistent manner, flying from clump to clump, staying longer at some before moving on. They seem to be larger than our queen bumblebees, emitting a definite low-pitched thrumming hum as they moved about the Jasmine flowers. 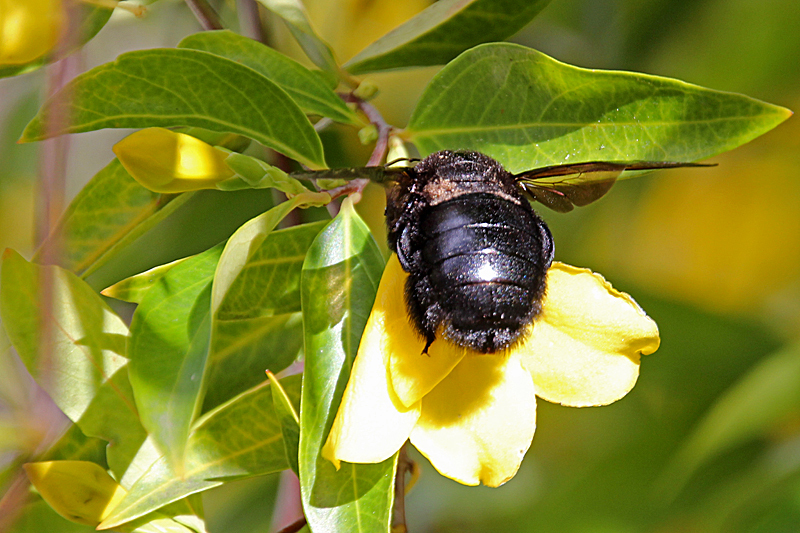 These large carpenter bees can be mistaken for bumblebees, but most have shiny black abdomens while bumblebee butts are usually covered with dense hair. The Jasmine flowers are about 1.5 inches across, so you can judge how large the bee is. Carpenter bees often forage on open flowers like poppies, but these flowers have a 1/2 inch long corolla with a smidge of nectar at the base. Rather than insert its head into the flower and mop up the scanty nectar with its tongue, it seems that the bee is slitting the corolla of the flower at its base to go directly to the source. Light amber colored wings beat furiously as the bee hovers over a flower, rejecting some and probing deeply into others. Notice how the bee is actually perched above the opening of the flower to reach to the end of the corolla where it joins the flower stem. They get their name from their habit of burrowing into decaying wood to create nest chambers, carving the holes by vibrating their bodies while rasping away at the wood with their mandibles. It sounds like a long, tedious process. Typically a single female creates just her own brood chamber, but multiple females may nest gregariously together in the same wooden structure. The intensity of their foraging on these flowers ensures good pollination for them, and enough nectar and pollen resource for the bee to provision its nest chambers. 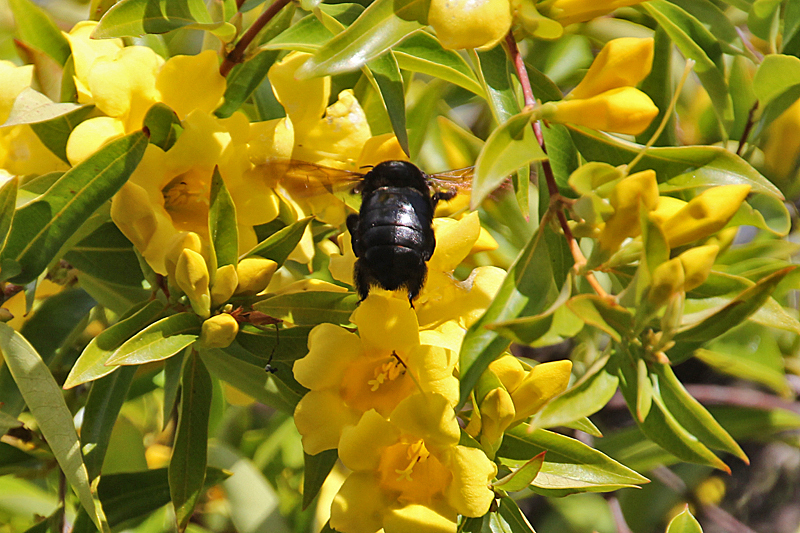 This entry was posted in Bees, Behavior, Fruit-Flowers, Gardens, Insects, Nature, Plants, spring and tagged bumblee vs carpenter bee, California Carpenter Bee, jasmine flowers, Jasmine pollinators, Xylocopa californica by Sue. Bookmark the permalink. 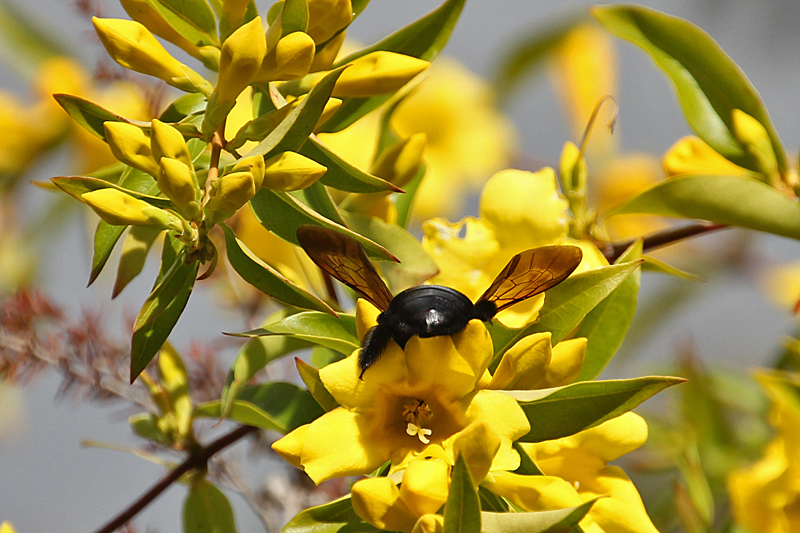 Thanks for the info on the carpenter bee. I didn’t know they nested in decaying wood. As always, a fascinating learning experience to read your post!